Below is a press release I was sent about RAP's recent action at the JCDecaux headquarters. While this all might strike people as borderline insane, it is important to remember that advertising and it the collective influence of commercial media is not a natural state of existence but rather a momentary manifestation of capitalism run amok. Removing its influence would have far reaching positive effects on our society which may help mitigate our effect on the climate, help resolve social issues that surround economic inequality, and generally allow for an atmosphere of collectivity to appear out of a deeply selfish, every man for himself, economic model that dictates large portions of our existence. So maybe this is less crazy than you think and simply beginning of something new. Ahead of the international day against advertising taking place on the 25th of March, the french association Resistance à l’Agresion Publicitaire (Resistance to Advertising Agresion) invited itself at the headquarters of the paris-based multinational company of billboards JC Decaux. 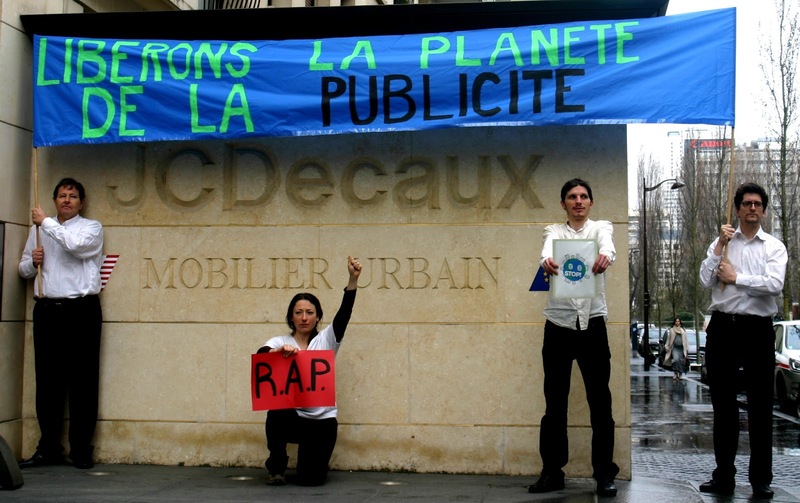 On the banner : "Let's free the planet of ads"
Khaled Gaiji, President of RAP declares: “ in addition to violate citizens freedom of (no) reception by invading public space with advertising, the world leader of billboards also systematically violate French laws on billboards. We are here today to denounce this situation and ask to JC Decaux Executive office an appointment in order to discuss solutions to this issue that has already lasted too long”. After unpholding a banner “let’s free up the planet of ads” next to JC Decaux‘ headerquarter’s logo, Julien Simon, Human Resources Director, came to meet the President of RAP and committed to organize an appointment as soon as possible. RAP will make sure this commitment does not go unheeded.